The mini LED stage effect lights is a new design economical products with low cost and amazing performance. 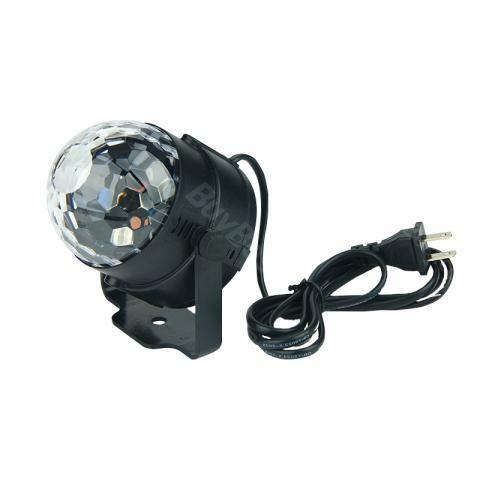 It's ideal for Disco, Ballroom, KTV, Bar, Stage, Club, Party etc. • Delicate appearance, streamline design, small size, light weight, light spots, is an ideal room lamp. • High quality LED light source, low power consumption, high brightness, no 3 light bead comparable, stable performance, long service life. • The selection of high transparent mirror, ensure that losses from the LED brightness. • Multi-channel mode options, a variety of stroboscopic mode, with gradient, jump, water and other effects. • 4 irradiation area in 30 square. • Small and exquisite in appearance, convenient in installation. • Suitable for Disco, Bars, Pubs, Clubs, Roller skating rinks, KTV, party, celebration, Festival, Store ,park and other appointed place. awesome light for any party, has to be right on the speaker to activate the sound mode but other than that i love all the settings and modes. it would be a big improvement if more colors could be added to it's range. Love these lights! We bought our first one last year at Target on a whim. Super easy to set up. I spent more time fiddling with the extension cords and timer than I did actually putting these lights up. We literally had our house decorated for the holidays in under ten minutes. I ordered those lights last minute for my daughter’s birthday party and it arrived the next day. Dance room was an absolute hit, kids spent most of the time there, didn’t even want to watch a movie. Two lights were more than enough for the room approximately 12x14. I also added UV lamp and it worked very well together with those lights. Very happy! These lights look and work great. I bought them for my Halloween party coming up and decided to get them early to make sure they work. Just one of the lights is bright enough for one room so now I have the other light to expand the party into other parts of the house. I sat listening to music and watching the lights for about an hour. Will definitely be an awesome display for the party in October. This is a laser pattern projector. It has 3 types of pattern. The color is green and red, which is exactly what I need. Because it is perfect for Christmas. Save a lot of time for decorating outside of the house. What's interesting is that it can be switched to light-with-the-music. Must be good for the party. Love it! I couldn't believe that they would be any good based upon the price. Well was I surprised! They are incredibly bright, respond wonderfully to music and the two easily fill a medium-sized room. Further, the seller responded *instantly* to a question that I had and wanted to make sure I was happy. These are awesome. Don't let the great price fool you. So efficient. It's amazing how it works with music and it's tiny size.